As the whole world knows Apple announced their iPhone 5 yesterday furthering the journey into the future where phones will probably just be embedded into our brains at birth. Apple’s release made me think of how far the technology for cell phones has come in so short a time. Thus the inspiration for this week’s Throwback Thursday. Anyone under the age of 20 or so probably doesn’t realize that some of us remember a time without cell phones. 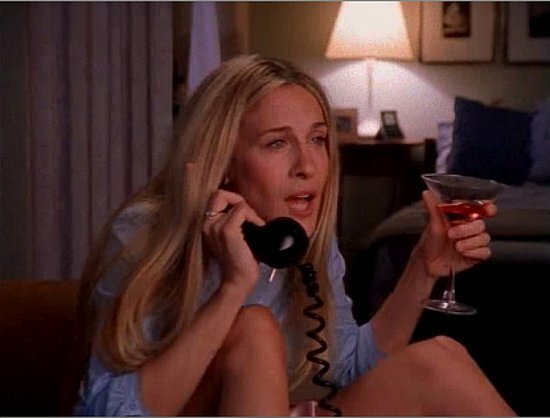 A time that if you wanted to talk to someone on the phone you had to call their landline…the horror! I have distinct memories of my teenage years getting calls from friends or boys and if I didn’t want my parents prying ears listening in I could only hide in place as far as the cord would go. The first hand-held mobile phone was demonstrated by Dr Martin Cooper of Motorola in 1973, using a handset weighing around 2.2 pounds. In 1983, the DynaTAC 8000x was the first to be commercially available. 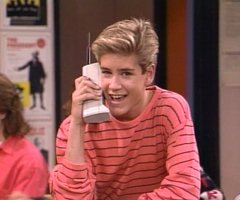 At that age having a cell phone made you rich/cool and awesome, see one Zack Morris below, who I think made the “brick” phone iconic. Now that I think back, where did he store it? Definitely wasn’t fitting in his pocket. I also remember that my Dad had a car phone installed into his truck which at that point was just as crazy as having a mobile phone. Eventually cell phones became more popular but unlike these days when kids are able to dial on the iPhone as a toddler and own one at the age of 5, parents didn’t just give them away all willy nilly. Originally these new fangled devices were a little pricey and people weren’t just running out to buy them in droves. MARKETING NERD, ALERT (that’s me), someone at the phone companies was a marketing genius because they began running campaigns based on a very powerful emotion, FEAR. Commercials started running showing teenagers getting in car accidents and breaking down at night and not having any way to call for help. This catapulted parents into action, which is the only reason I and probably a lot of other people my age were allowed to have them. Let me tell you the sense of freedom you got having your own phone was AMAZING! And at this point they didn’t even have texting! 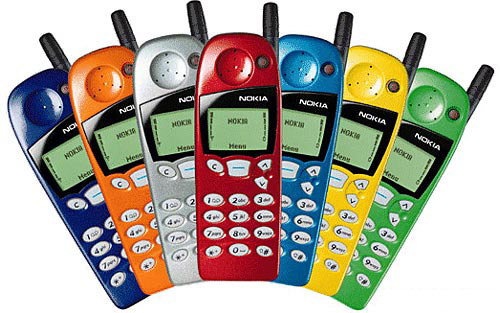 I had one of these babies, a sweet, unbreakable Nokia phone, with multiple face plates depending on my mood. I swear that if I pulled it out today it would probably still work. Yes phones have come a long way, and I hope we never have to go back to a world without them, I could not live without the screening capabilities. Nerd Alert! : Excuse me an Ocar-what?